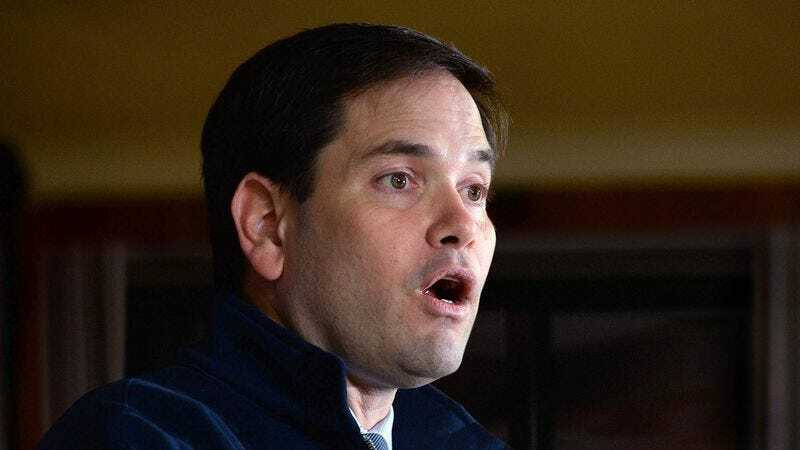 MIAMI—Just hours after delivering the final speech of his 2016 campaign, former Republican presidential candidate Marco Rubio reportedly awoke Wednesday to the terrifying realization that he was unable to vocalize any unscripted sentiment. Sources said Rubio first noticed his horrifying condition upon sitting down at the breakfast table when he attempted to greet his family but could only produce a series of strained, heavy wheezes. The panicked Florida senator reportedly then clutched his throat as he struggled to articulate an unrehearsed expression of love for his wife and children, sputtering as he frantically searched for a memorized line of dialogue that had been carefully vetted and honed over many hours of coaching sessions. Concerned family members confirmed that, without a meticulously constructed text to work from, Rubio was forced to rely solely on hand gestures and grunts to convey any thoughts that passed through his mind. Upon realizing that his voice would only return when a heavily workshopped and polished phrase was placed before him to recite, the former presidential hopeful reportedly canceled his final goodbye speech to his staff until the heartfelt message could be revised numerous times and typed out for him in full. When reached for comment, a despondent Rubio moaned quietly.